The daughter of King Midas brings her father’s touch to UK mobile casino in this 25 pay line slot from NexGen Gaming. But what makes the mythical game so popular? 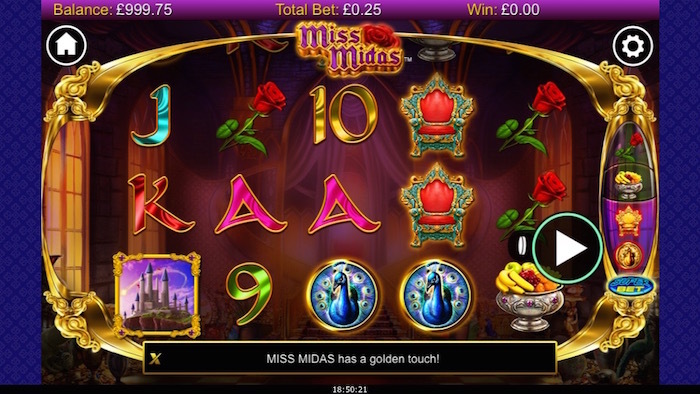 Now widely considered one of the most played online slots for iPhone, iPad or Android, Miss Midas comes willing in both free play or real money betting versions. It offers up to 25 free spins, includes the “Superbet” feature and pays out as much as 2,500 coins. Can Miss Midas turn your mobile phone into gold? Just recently, Slotsquad gathered intelligence to suggest that UK Nektan Casinos were adding some NexGen Slots to their games lineup. Obviously only the best ones would be considered. The Miss Midas mobile slot is one of the first. Miss Midas takes the mythology of ancient Greece and upgrades it for modern mobile casino players with delightful graphics, smooth gameplay, simple controls and lucrative rewards. The slot has a payout rate of 95.3% and uses the Midas touch on Wilds to increase player wins through symbol substitution. NexGen Slots work well when emigrated to mobile and now even more so upon the Nektan Casino platforms. What we like about Miss Midas is the inclusion of the “Superbet” feature. Along with games inherent use of the Midas touch using Wilds, these are both strengths that help boost the playability score. It’s responsive too, regardless of your handset preference. Miss Midas for iPhone, iPad or Android fits the frame and we’re talking graphics, sound and betting functionality across the board. NexGen Gaming creates a simple yet effective experience that improves for those who want the real money vibe over free play. But both versions are entertaining. On the five reels and its business as usual with NexGen using the standard card value symbols for the lower payouts. However with Miss Midas you can still win up to 100 x your line bet with Aces. Other symbols of medium value include a rose, fruit bowl, throne and a peacock. If you play UK mobile slots for real money and want to know which bonus icons are the best winning triggers, it’s the Wild and Scatter symbols. Play Miss Midas and you’ll be wanting to find gold finger herself on reel 3. Alternatively the Midas Castle Scatter for the slots free spins and the jackpot of 2500 coins. The arrival of NexGen Slots at Nektan Casinos means UK players can take advantage of the NexGen “Superbet” feature. The Miss Midas Slot has a Wild feature and will touch potential winning combinations therefore turning them to Gold. Note that the Miss Midas Wild is found on Reel 3 only. Another exciting winning possibility is the Scatter Castle Symbol that can offer up to 25 free spins, but what makes this mobile slot feature particularly good is that you can re-trigger additional free spins during the bonus. The “Superbet” feature from NexGen allows real money players to increase their potential winnings by building the stake and activating additional Midas touch symbols. It will command an additional 25 coins per spin, but these larger bets could return some huge payouts and are worth their weight in gold. You can play the Miss Midas mobile slot for with a bonus if you play at Spin Princess (See below). You can even play demo modes of the game for free without even signing up. If however you’re looking to deposit and play for real money, Miss Midas is a fixed 25 pay line slot, so you’re always playing 25 lines. Coin values range from £0.01 to £2.00 per line with betting flexibility of between 25p to £50.00 per spin. If you opt to use NexGen “Superbet” and turn on the enhanced betting function for the extra cost, but at the same time accessing greater benefits, the minimum bet is 35p. NexGen “Superbet” will suit high rollers and premium wagering players. The payout rate for Miss Midas varies from between 95.3% and 96.6% dependent on the “Superbet” level in play. If you use “Superbet” level 3 for the highest spin cost, Miss Midas can turn more symbols to gold so therefore the payout rate increases. The Miss Midas Slot Jackpot is 2,500 x your line bet. As far as UK mobile slots go and getting one with the pay lines to match the payout punch, NexGen gets it almost right. Miss Midas offers more than your basic level game and puts power to the player when needed with the “Superbet” function. There are cheaper mobile slot games out there and choosing the Nektan nameplate will get you spins elsewhere for just 25p. But Miss Midas if she wants to can change your phone to gold, she’s also available to play for free in demo mode. Not the cheapest of games around granted, and perhaps those free spins are more lucrative than we’d like, but the Midas touch is still very much worth its weight in gold to winning players.